Happy Fourth of July Weekend!! There is no better time to embrace classic American style. The more patriotic, the better! 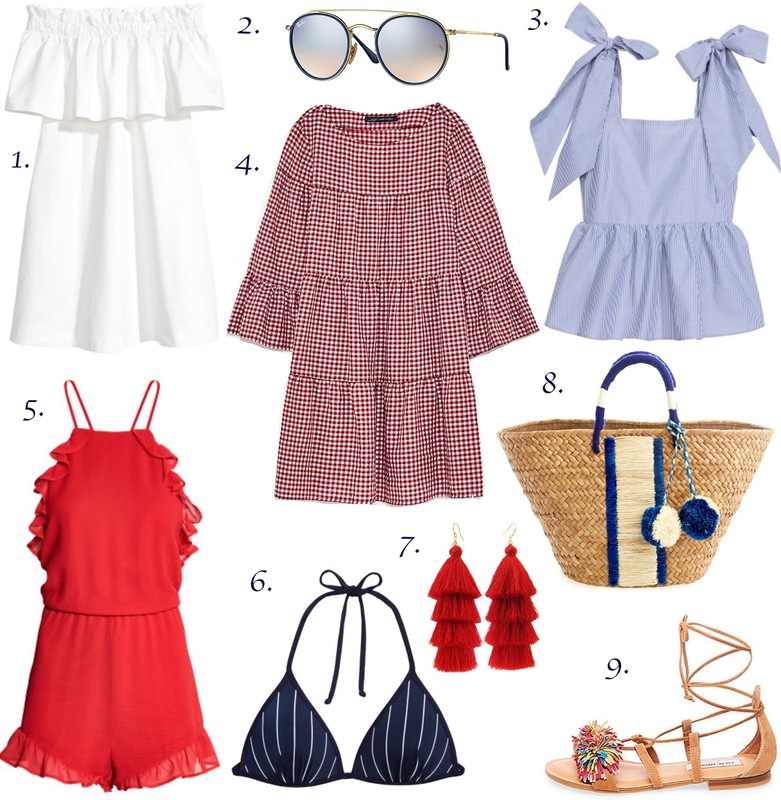 I'm bringing out all of the stripes, gingham and red, white and blue in my closet. I like these looks because they could easily go from a pool party, to a barbecue, to watching fireworks. I can't wait to experience the holiday in D.C. and see fireworks over the National Mall! What are your Fourth of July plans? I thought I'd take a break from my usual style posts to talk about something else — my favorite perfumes! I know a lot of people who have a signature scent (like Chanel No.5) but for some reason, I've never been able to narrow it down. I tend to choose my perfume depending on my mood or even outfit. That being said, here are my four go-to scents and why I can't live without all of them! Daisy was my first big girl perfume that I got in the eighth grade. Before that, the top of my dresser was covered in fruity body sprays from Bath & Body and Victoria's Secret PINK. I remember seeing Daisy in Teen Vogue and knew I had to have it. I got it as a Christmas present from my parents and since then, I have gone through at least three bottles. I use it more often than my other perfumes because it is the perfect balance of floral, feminine and is not too heavy (I hate musky-smelling perfumes!). I'm obsessed with peonies (hence the ones above that I couldn't resist at Whole Foods) but I think it is actually the notes of suede and red apple that make this perfume so addicting. It has a juicy yet sophisticated smell. I also love the size of the bottle because it is only 1 fl. oz. so it is perfect to pack in my carry-on. I finally got this scent about a year ago after stopping to smell it every time I was at Sephora! It also has notes of peony (clearly I like floral scents) as well as magnolia and rose. It is so girly and I am guilty of spraying it on anytime I am wearing pink. Not to mention the bottle is beautiful! While this scent also has floral notes, it is much more crisp than my other favorites. It contains pineapple, mandarin and grapes, which makes it smell so fresh. I'm not sure why but it definitely smells the most grown-up of all the scents I use, which is why I am often inclined to spritz it on before work. I also think this scent works better in the winter as opposed to my Chloe and Marc Jacobs picks. It's been a few weeks since my last post because I have been crazy busy! I moved to Washington D.C. last Monday and started my summer internship a few days ago. That means my most recent #ootds have been quite professional! Since I haven't had time to take photos for an outfit post, I thought I'd share my summer internship staples. Since it has been 90 degrees all week in the District, I've been sticking to sleeveless dresses with high necklines that help me stay cool but still look put-together. Most of mine are various shades of my favorite color blue, but I saw this light green one at Banana Republic the other day and I'm still thinking about it! I also never go without my pearl earrings — they make any outfit look more elegant. Also, I almost always carry my Longchamp large tote that easily fits all of my work essentials, including my agenda, comfy shoes for the commute (I like to slip on heels once inside) and a cozy sweater for when the office AC is on full blast. And I think it is important to invest in well-made, solid-colored blouses and skirts that can translate into lots of outfits. 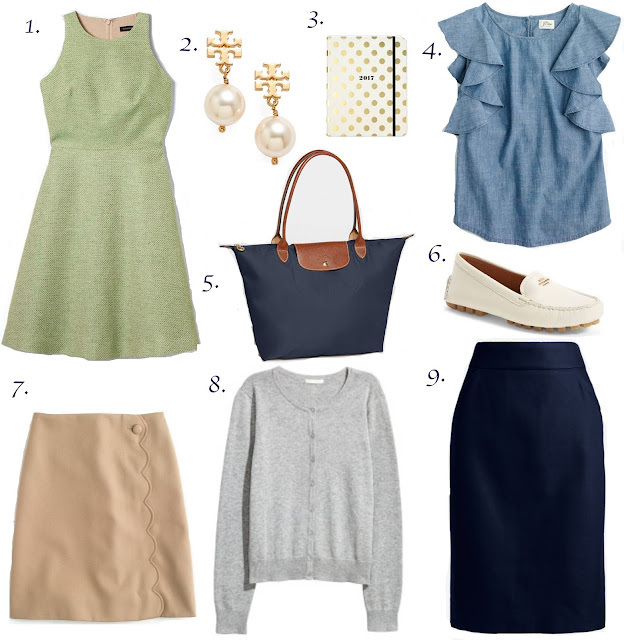 I've had the same navy skirt from J.Crew for four years and it hasn't failed me yet!